I seriously doubt that any of us would say that our goal is to keep our people away from God’s gospel, but are we subtly doing just that by what we’re omitting? Many of us are responsible for putting the weekly liturgy of our churches together (Liturgy is simply a fancy word for what we do when we gather as God’s people). This is a weighty responsibility that shouldn’t be taken lightly and should be entered into with humility. I’ve starting to see a change in the world of “modern” church music. Gone are the days of treating a singing set like a rock concert where we choose songs based on tempo with one or two up beat songs and then a ballad. Choosing sets based on complimentary keys alone is robbing people of experiencing the depth God’s story through song. It’s not that tempo and melodic transition aren’t important, but they certainly shouldn’t be our primary focus when choosing what our people will sing. As worship leaders and service planners we should be actively trying to assist our people to encounter the very Truth of God through our songs and service flows. God started His story with Himself and His Glory. So typically I will begin with songs about the greatness of God. THEN and AFTER people have seen the greatness of God and their depravity, I will bring in the cross because that is when it is infinitely important. Then I go to songs on the resurrection, surrender, and so forth. I tell the Story, because the Story, not my songs nor my voice, is the power of God. Boswell, Matt (2013-12-01). Doxology and Theology: How the Gospel Forms the Worship Leader (p. 89). B&H Publishing Group. Kindle Edition. I love his intentionality with song selection. We use a similar strategy when choosing music at Shepherd’s Gate. We often start the service off with a song declaring the greatness of God, his character, or something trinitarian in nature. We want our people to have an understanding of who God is. Next, we sing songs about our broken state and sinfulness. This reminds us that we are helpless and can do nothing to earn a right standing with God and it makes songs about Jesus that much sweeter! We follow this up by singing about the sacrifice of Jesus on the cross. How he has taken our place and we can do nothing apart from him. Lastly we sing songs that are focussed on our response in joy, empowered by the Spirit of God to do the work he has prepared for us to do in advance. This gives us a good framework for song selection but there are certainly other options. 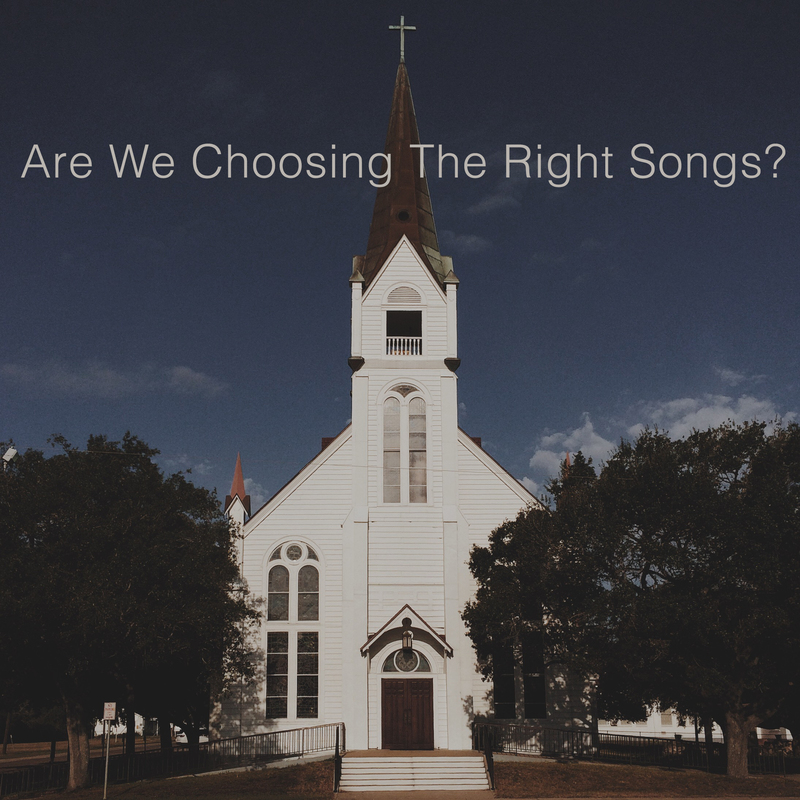 Having this in place has helped us ask the right questions when choosing what songs should go where or if we should even be singing a song as a congregation. It’s important to choose songs that are easily sung by the congregation. The concept of the song can be easily lost if everyone is searching for the next note. Music should serve the text. This helps the congregation connect their heart (emotions) with their head (intellect) in experiencing the truth of God’s story. When we have the opportunity to speak in a service, we should do it succinctly, letting the word of God do what it says it will do. Early in my ministry I enjoyed using these times to expound on a theological concept (often talking way more than I should). More and more, however, I simply use this time to have the congregation read a scripture together. This brings new life to a song lyric or concept. I am a firm believer that we shouldn’t be planning services in a vacuum. It is good to surround ourselves with other worship leaders, pastors, and congregants who can speak into our process. The most important relationship, however, is between you and your senior/lead pastor. He is the primary shepherd of the congregation and carries the responsibility for the spiritual health of it’s people. Submit your service design to him and let him breath his wisdom and knowledge in to the planning process. All in all, the power is in the Word of God, not our cleverly devised services or song selections. Our services should be scripturally saturated. This will ensure that people have the opportunity to be transformed by God the Father, through His Son, by the Spirit opening His story to us. While I agree with being purposeful in song selection, one area you seem to have ignored is the seasons in the church. I’ve been disappointed over the years when, during the Christmas season, we only sing a token one or two “Christmas Songs” during services in Advent. This is the time of year when they are appropriate to sing, yet we miss the opportunity in favor of “regular” worship songs. As a Lutheran, I grew up singing certain songs at certain times of the year because they meant something and were an integral part of the worship. I sometimes feel we are trying to hide the fact that we are a specific denomination because we might offend someone. Cheryl, thank you for reading the blog and taking time to share your thoughts. I too, grew up Lutheran and have a deep love for the church calendar. In the true spirit of Advent we like to build anticipation for who Christ is and what he came to do. We do this by choosing music that still reminds us of the entirety of the gospel message as well as integrating more and more Christmas/Advent songs each week as we approach Christmas Eve. For example, this past week we sang two Christmas/Advent themed songs/hymns. Next week we have 3. The week after we have 4, including, one of my all time favorite advent hymns, Come Thou Long Expected Jesus. Christmas eve is all out. All Christmas hymns, all the time! “Our services should be scripturally saturated.” Such a wonderful truth that we all too often overlook! Thank you for posting. This really encouraged me today! Thanks for your comment. Isn’t it comforting to know that the word of God has the power to change lives! Only He does the work of Redemption! Thank you for your words of wisdom. This is very close in how I choose songs for our congregation. Singability is such an important part of this. Many people hear songs on the radio and then request Those songs for worship. There are great songs that just don’t lend themselves to congregational singing. I have been disappointed when I as a seasoned musician have attended services where songs were lead that even I could not follow a natural path through. If I had that issue, how lost are those who have no musical knowledge. Content over radio play is how I see things. Even my wife has suggested songs that I’ve had to say, “honey, that just doesn’t work.” Seeking God is the biggest part of the process for me. Asking Him what He wants to tell His people that morning. I must decrease. It cannot be about my choices, my style or likes. Some think it’s just picking some songs, or have told me that I put too much thought into it. It’s not just throwing some catchy tunes together to get a response from an audience. It’s leading Gods people in a part of worship. That is a tremendous responsibility. Enosh, thanks for your reply. Thank you for your words about walking in humility and putting the needs of the congregation 1st. Blessings on ministry brother!